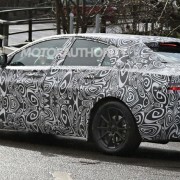 The Jaguar company is preparing to launch the small sedan XS to proudly stand in line against its competitors like the 3 Series from BMW or the Benz`s C-Class. 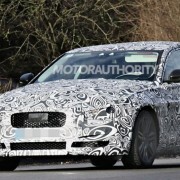 Spy shots have been rendered with the Jaguar XS being put to some tests, before seeing it into the showrooms next year, bearing the 2016 model name. 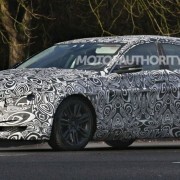 As for its body styling, the 2016 Jaguar XS seems to take its design from the XF, but with some tweaks of its own. Overall, we might be looking at a wider and lower design, with some sporty features. Underneath the 2016 Jaguar XS, there is a fresh new aluminum platform, called iQ [A1], with some Premium Lightweight Architecture (PLA) features, also found on the Land Rover Ranger Rover. 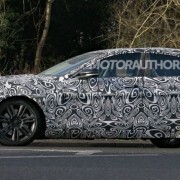 The aluminum platform however, was only confirmed for the XS model, but new three models are likely to be built sporting aluminum, including the next-gen XF. There are still no engine specs for the iQ [A1] based platform, but the British company has let some hints concerning the release of a new lineup engines named Hotfire. The Hotfire units will come with four-cylinder gasoline and diesel, with the latest fuel-efficiency technology, without affecting the models` power. We might be talking about a Hotfire put on the iQ [A1] platform as well, sporting a 3.0-liter engine and V6, which is already put on the F-Type models.